NEW DELHI — As it keeps a watchful eye on its neighbor China, India is further cementing defense ties with Vietnam for the joint production and transfer of technology of homemade weapon systems. The new partnership was announced March 3 during a visit by Vietnamese President Tran Dai Quang. The two countries are expected to sign an agreement for a line of credit from India worth $500 million that will go toward building capabilities through Vietnam’s defense industry. “Both sides agreed to further enhance defense ties, including through exchanges of senior-level defense delegations, regular senior-level dialogues, cooperation between the two armed forces, port calls of naval and Coast Guard ships, capacity building projects, procurement of equipment, and transfer of technology,” according to a statement issued by the Indian Ministry of External Affairs. An official with the Indian Ministry of Defence noted that the idea of an Indo-Vietnamese defense partnership is not new. “Earlier, too, we have assisted them in building capacity including training their submarine personnel and logistic support for their ships, amongst other things,” he said. India may “at a later date” offer the Brahmos cruise missile for export, according to Anil Jai Singh, a defense analyst and retired Indian Navy commodore, but the country can currently offer the export of ships; patrol craft; sonars; radars; communications equipment, systems and auxiliaries; and submarine repair and refit. A Chinese company's news release, which has since been modified, has revealed plans to speed up the development of China’s first nuclear-powered aircraft carrier. The MoD official noted that it is important for India to help build capacity in friendly countries as part of a robust, cooperative capability to counter the many traditional and nontraditional maritime threats in the region. The bilateral deal may prove important to India’s Act East policy. 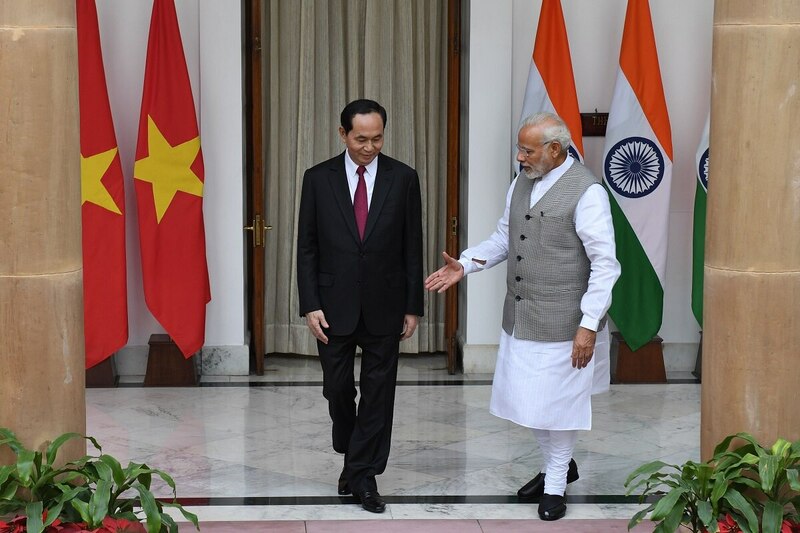 "Vietnam is often viewed as a linchpin in India’s policy of ‘Act East,’ and subterraneously it supports a counter-encirclement strategy against China,” according to independent defense analyst Probal Ghosh. “Historically, the Vietnamese share an innate distrust of the Chinese, and the geostrategic importance and symbiotic nature of the Indo-Vietnam bilateral relations makes it imperative for India to not only encourage such ties but actively nurture it in every possible way." Arun Prakash, a retired admiral and former service chief, expressed hesitation about the agreement’s potential results. “India can offer a line of credit, as in the case of Sri Lanka and Bangladesh, for Vietnam to place orders for ships in Indian yards. However, capacity will be a constraint,” he said. On a political level, Khurana noted, India and Vietnam ― and other like-minded nations ― will need to continue exerting pressure upon China to uphold the established maritime order in terms of freedom of navigation and overflight. “India must be smart in doing this so as not to cross China’s ‘red line,’ even though it is unclear and dynamic, too. But it is amply clear that a formal military alliance with Vietnam (or any other country), or developing a military base in Vietnam, or progressing the quad in the uni-dimensional military domain will not be a smart thing to do,” he said.